What started as an Internet webpage in 1999 has resulted in a comprehensive work of arms and ammunition literature intended for historians, researchers, collectors, EOD personnel and officials.
! BOOK IS OUT OF PRINT ! "SOVIET CANNON - A Comprehensive Study of Soviet Guns and Ammunition in Calibres 12.7mm to 57mm" is the result of more than ten years of research by Christian Koll. It is the first book in any western language that brings together all available information on medium-calibre Soviet arms and ammunition. This type of weapon includes large calibre machine guns, aircraft guns, anti-aircraft guns, light tank and anti-tank guns, as well as infantry fighting vehicle cannon and grenade launchers. In a total of 586 pages this book covers every aspect of these weapons including the history of development, the operating mechanism, the types of ammunition made in all of the Warsaw Pact countries including markings and designation systems, ammunition packaging, belt links and charger clips, powders, high explosives and ballistics. Besides standard service issue weapons, many experimental designs are described as well. Approximately 1,150 colour photos and drawings of arms and ammunition illustrate this book. Most of the pictures were taken in Russian museums and from leading collections from all over the world. An entire chapter is devoted to the history of the Soviet ammunition plants from the beginning to present. For the first time a comprehensive study of Soviet and Warsaw Pact ammunition manufacturer codes is provided, comprising approximately 380 different entries, most of which are identified. Contained on a CD-Rom that is enclosed with this book are another 286 scale drawings in colour of cartridge cases, projectiles and components, both whole and cutaway views and showing all markings. Compared to the "Russianammo" webpage, this book offers much more information, photographs and drawings. While the webpage comprises only 69 pages, the contents of the book including the drawings on CD-Rom is 13 times that amount. Please note that the original "Russianammo" webpage is at the state of 2005 and is no longer updated or maintained. 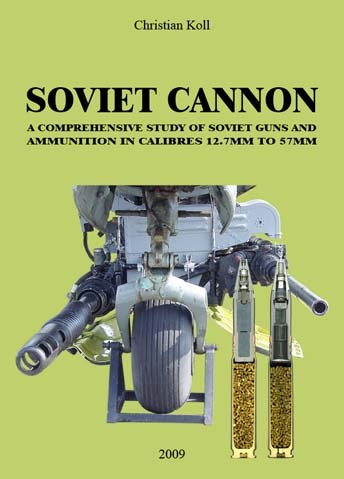 The book "Soviet Cannon" is out of print since 2012. I have no plans for any additional printings, that is - of course - unless somebody is interested in a substantial amount of copies. Instead of a printed version of the book I can offer the book on CD-Rom. The book is in PDF-format (PDF-version 1.3, printable) and will also contain the drawings documentation (Appendix 3). Please refer to the "Prices & Shipping Costs" section further below on this page for more details. - the shipping method (Priority or Economy). Your order will be confirmed by a reply email that contains an invoice and the payment information. The book will be shipped as soon as the money has been received. By placing an order the customer declares to have fully read and understood the terms of service and fully agrees to those. I accept payments via PayPal and bank transactions in Euros (€) drawn on my Austrian bank account (using "IBAN" and "BIC"). Sorry, but I do not accept any checks or credit cards. The payment information will be provided in the order confirmation email. The shipping costs are each provided for a single CD-Rom. If you would like to order more than one copy, the shipping costs will be calculated individualy.